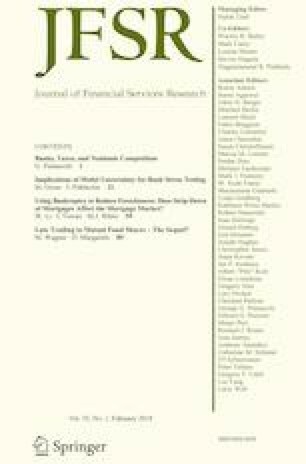 This special issue contains papers from the 6th International Conference of the Financial Engineering and Banking Society, which was held in Malaga, Spain, June 10–12, 2016. Extended versions of 13 papers presented at the conference were submitted to this special issue. The accepted papers cover bank performance, effects of supervisory actions, transmission to the real economy of funding shocks to banks, and characteristics of renegotiated debt contracts. Despite the range of the topics, all of the papers have an important feature in common. All their data samples cover the periods before, during, and after the financial crisis. Thus, the results obtained in these papers are useful to understand how banks may improve their strategies, and how future policy to enhance regulatory and supervisory effectiveness after the financial crisis may be driven. The special issue starts with the paper of Castro and Galan (2019, this issue), who analyze the drivers of total factor productivity (TFP) of Spanish banks from early 2000 until after the financial crisis. The Spanish banking sector is an interesting laboratory to carry out this type of analysis because, in 2012, Spain received European Union funds to recapitalize and restructure its financial sector. As a result, after the crisis, the Spanish banking sector underwent a significant restructuring, which included large numbers of bank mergers and a transformation of its savings banks into either social foundations or commercial banks. The key questions addressed by the paper are how the Spanish banking sector may sustain its level of productivity and whether there may still be room for further consolidation following a major restructuring process. To answer these questions the authors analyze the underlying reasons behind the changes in banks’ productivity over time. Using a variable cost frontier approach the authors decompose changes in TFP into inefficiency changes and scale economies changes. Moreover, in the estimation of the cost frontier the paper takes into account equity capital and risk measures in order to avoid biases in the estimation of scale economies. One novelty of the paper is the approach proposed for measuring risk. The authors present a unified composite ex-ante risk measure that incorporates different types of risk regarding credit, liquidity, solvency, profitability, and the macroeconomic environment. The results show that following a period of pre-crisis growth, productivity of the Spanish banking sector declined after the height of the crisis, but that larger banks were less affected. However, the paper concludes that there is still some room for potential improvements in productivity by exploiting scale economies and enhancing cost efficiency. Finally, the results posit that risk, capital levels, competition, and input prices are drivers of TFP changes, which help to explain the differences in TFP between banks. In the second paper, Pereira et al. (2019, this issue) develop an empirical analysis to test how depositors and the shareholders respond to enforcement actions (EAs) by bank supervisors. The authors perform this analysis for US banks over the period 2004–2015. Considering EAs as an essential part of the supervisory mechanism to ensure that banks maintain safe and sound business models, they investigate how financial markets and depositors react to EAs using an event study methodology as well as multivariate analysis. The authors validate the results from the empirical exercise across the sanctioned (treatment) and the comparable non-sanctioned (control) banks by using propensity score matching. One novelty of the paper is the unique dataset of EA announcements by US supervisory authorities, which the authors built themselves. The paper’s main contribution is to provide an in-depth analysis of how two key bank stakeholders react to EAs. The paper shows that the equity market is able to discriminate among EAs by their severity. It penalizes banks more severely for cease and desist enforcement actions, but responds weakly to enforcement actions that are civil money penalties or formal agreements. Regarding depositors’ reactions, the paper finds a reduction in demand growth following cease and desist enforcement actions while core deposits increase, possibly due to higher interest rates. Interestingly, deposit growth increases in response to a formal agreement, which can be perceived as corrective measure. The results provide insights into how bank stakeholders interpret and react to supervisory interventions. Next, Alvarez et al. (2019, this issue) evaluate the impact of a liquidity funding shock on real GDP and credit growth among EU countries. The innovation of the paper is to use panel Vector Autoregression methods. The sample consists of both core (Austria, Belgium, France, and Germany) and periphery (Ireland, Italy, Spain, and Portugal) EU countries over 2003 to 2015. The liquidity funding shock is measured by an increase in the Euribor-OIS spread. They show that following such a shock both credit and GDP decline, but GDP reverts faster than credit. The effects of the shock are stronger and last longer on the periphery countries than in the core countries. Here, the periphery countries are more dependent on wholesale funding and that likely has something to do with the stronger responses. Finally, Godlewski (2019, this issue) studies the renegotiation of bank loans. The main contribution of the paper is to characterize how the terms of these loans change and what factors determines the number of amendments to the loan. The author applies his empirical analysis to a sample of 1455 firms that renegotiate 1508 loan-contracts arranged by 84 different loan agents from 1999 to 2014. The sample coverage is of 32 different European countries (including the Russian Federation and Turkey). The paper finds that the most frequent amendments are to a loan’s amount and maturity, though other types of amendments are also frequently used. The paper also conducts an ordered logit analysis to identify factors that determine the number of amendments to a renegotiated loan. It finds that in a renegotiated loan, the number of amendments increases with the loan maturity and in countries with stronger creditor rights, and decreases for secured loans as well as with the league status of the lead bank. The paper links these to the voluminous literature on contractual incompleteness and renegotiation and, in turn, will be useful to this literature by providing more facts for it to draw on. In closing, we express our sincere thanks to all authors whose contributions have been essential to this high-quality special issue. We also acknowledge the support of all reviewers by providing critical evaluations, insightful comments, and constructive suggestions for the submitted papers. Without their help and their considerable time devoted it would have been impossible to achieve this special issue.